If you’ve travelled to Italy you are familiar with the extraordinary works of art everywhere you turn. 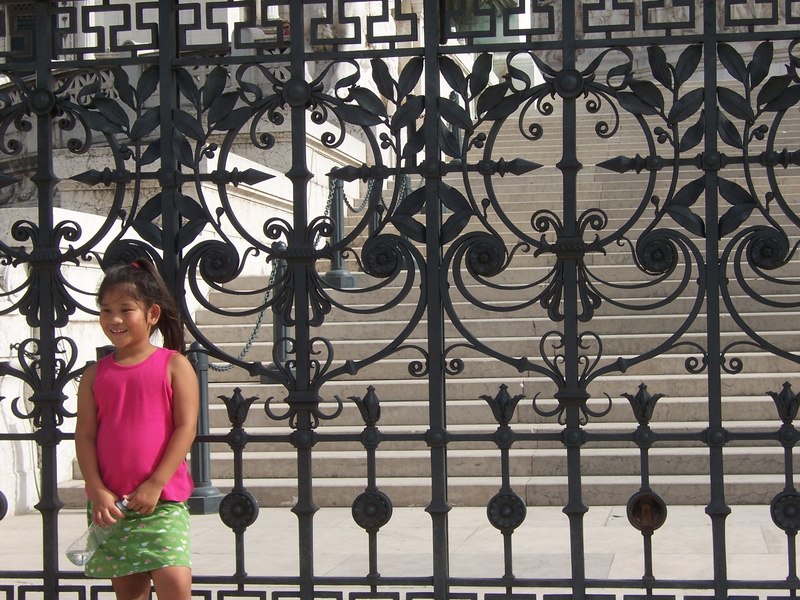 And in this case, even the iron fences surrounding landmarks are works of art. The curves, the gracefulness of the circular patterns and how they are contrasted with the evenly spaced verticals. You just don’t find this kind of design in northern New England–nor would it be appropriate in the white clapboard neighborhoods supported by granite block foundations. It works beautifully in Rome, Italy as you might imagine. White limestone buildings and staircases provide a high contrast to the black wrought iron allowing the design to absolutely sing out against the sunbleached whites in the background. The intricacy of the design is so impressive. I have plans to utilize the beautiful arcs and patterns in future work as foundational design elements or as delicate calligraphic lines sweeping through an abstract work. This entry was posted in architecture, design, Italy, pattern and tagged AnnTrainorDomingue, Italy. Bookmark the permalink.